2014 January | Federation of North-American Explorers | Semper Parati! 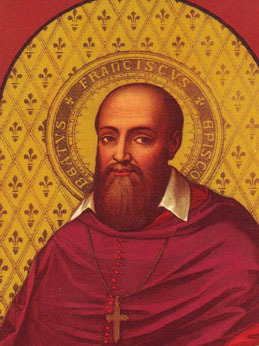 Our saint of the month for January is Saint Francis de Sales, who’s feast day is the 29th of this month. Francis de Sales was the oldest of twelve children. His parents were well to do and pious, but they intended for Francis to become a lawyer and advance his family’s influence and power. He was a very good student and, with high honors, earned doctorates in both civil and cannon law. When he returned home from university, he was offered an honorable position in the senate of Savoy. But he soon received a message in his heart. “Leave all and follow Me.” He declined the senate position and entered the seminary to become a priest. His family was much opposed to this, especially since they had arranged a marriage for him that would further advance their family’s standing. Francis prayed constantly for his family, and was always kind and gentle. Soon they accepted his decision. After his ordination he was assigned to the diocese of Geneva, Switzerland where the Calvinists were strong. His gentle ways, and simple clear explanations of Catholic doctrine won many calvinists back to the Catholic Church. Indeed he was so successful at wining converts, that many times the Calvinists spread lies about him, laid all kinds of plots against him, and even made attempts on his life. Eventually he was appointed bishop of Geneva. He continued to work tirelessly to evangelize, and even used sign language to reach the deaf. It is said that during his time there he converted over 70,000 people back to the Catholic faith. Many of his letters and spiritual guides are still widely used today. They are of such quality that he was even named a doctor of the Church. St. Francis de Sales was kind and gentle, even to those who persecuted him, but he was no push over. When it came to following our Lord, he never wavered in the slightest. Wether it was enemies of the Church or even his own family trying to dissuade him, he always held firm. Learn more at the Patron Saint Index. Awesome Francis de Sales coloring page. Welcome to the newest member of our FNE family! Please welcome Maine, the Pine Tree State, to the FNE family! By approval of our general commissioner, we are pleased to announce our newly forming group, the 1st Fr. Sebastian Rasle FNE (with girls’ sections to launch later in 2014).